If you and your spouse like your golf scrambled, come to the Nine-Dine-And Wine event at the Stony Creek Golf Club in Oak Lawn, August 1, and stay at the nearby and affordable Best Western Inn Suites Midway Hotel! Stony Brook Golf Club features a par 3 course as well as the challenging eighteen hole course. The venues are accented with creeks and stands of mature trees. PGA lessons are offered for both kids and adults, novices and experienced golfers. The August 1 Nine-Dine-And Wine event is nine holes of golf, featuring a 2-player scramble (best ball from the pair on each hole), and a five course meal and prizes. The $39 fee covers green fee, cart and the dinner. Tee time is 5 pm. Reservations are encouraged. Also at Stony Creek are three lighted practice greens, along with a 44 station driving range, a golf simulator, and an 18 hole miniature golf course with a waterfall. Bocce ball courts and horseshoe pits are available. Five banquet rooms can hold from 35 to 120 guests. The grill features sandwiches, burgers and the 19th Hole Bar. Stony Creek also has an intimate gazebo area which is suitable for weddings. 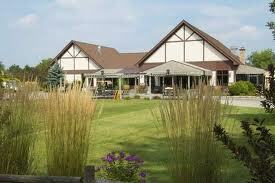 The Stony Creek Golf Club is at 5850 West 103rd Street in Oak Lawn. For reservations call (708) 857-2433. The Best Western Inn Suites Midway Hotel, just minutes away from the Stony Creek Golf Club, offers affordable guest rooms, free breakfast, an indoor swimming pool, hot tub and a fitness center. Special AAA rates are available. Call the property direct at (708) 497-3000.